Prehistoric artists have long used human extremities (sometimes animal too) to make art. Hand-prints and stencils are found in rock art all around the world and have been linked to artists’ ‘leaving their mark’ in a location, or using such contact as a gateway to a spiritual domain. 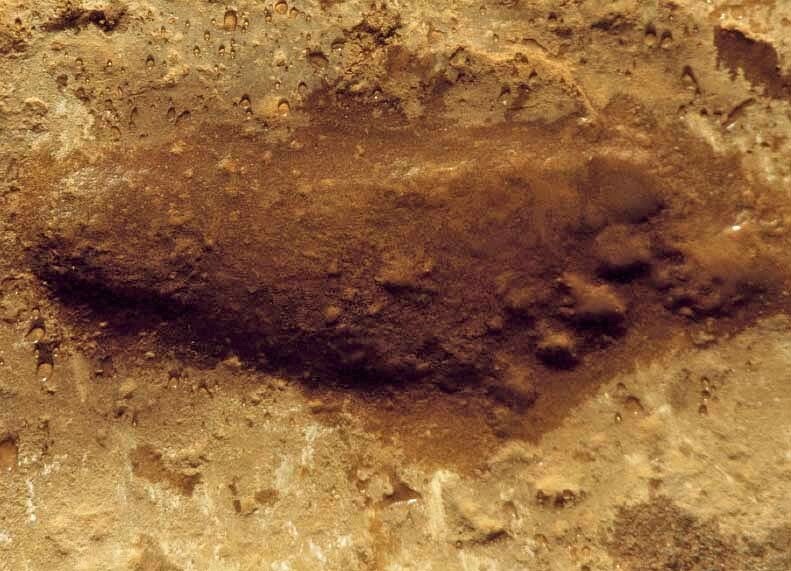 Slightly less common are footprints although they too are present, especially in African rock art. In going through the African rock art archive at TARA I found that while hand-prints are often painted (although some are engraved), almost all cases of footprints are carved or engraved into or out of rock surfaces. Even more fascinating was the large number of these footprint engravings that are in Namibia. The prints are often of only one foot but also occur in multiples (rarely in pairs). In some cases, the footprints are accompanied by animal engravings or tracks. One explanation for footprints such as these is that they depict places where healers or other spiritual leaders (shamans) walked in and out of the earth. Such prints are frequently found next to or inside tunnels and fissures as if to indicate a path or entrance into the spirit world. In this way the rock face was not merely a canvas but a kind of veil leading to a spiritual world. 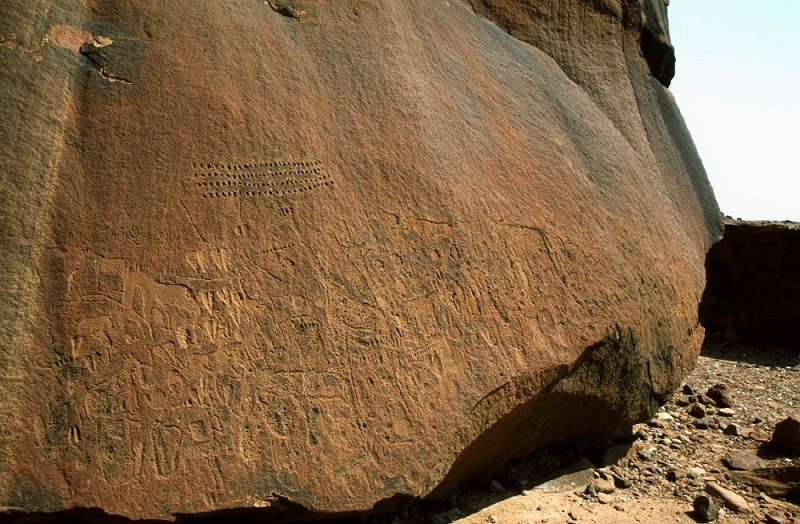 Multiple carvings and engravings on a boulder in Twyfelfontein, Namibia. Animals, animal tracks, cupules, handprints and footprints are all depicted. Indeed, Siyakha Mguni has described the beliefs of various San communities that associated the underground with the birthplace of the earth. The creation story of the G|wi, a San group from the Kalahari, puts it that when the trickster deity Pishiboro first appeared in the world, he emerged from the depths of the earth by climbing up through a deep waterhole. [i] The G|wi people therefore believe that this world and the underworld are linked through deep waterholes. A San group from the Orange River in South Africa had a similar creation story recorded in the mid-1800s. [ii] According to them all their ancestors and all the animals came to earth out of a hole in the ground at the roots of a large tree. Such stories seem to be borne out in the rock art. Many of the footprints in the Damaraland region of Namibia are found near water sources such as rivers. Additionally, they are depicted facing up, as though the bearer were walking out of the underground, spirit domain onto earth. Footprints in other countries are also associated with spiritual traditions and rituals. While recording in Algeria’s Oued Djerat in 2002, a guide shared the story of a ritual to pray for rain associated with an engraved footprint with David Coulson. It was a custom to put goat butter on the footprint in order to bring rain to the area (and thus more butter), he said. The person would then put a small rock on top to protect the butter and this was a sign to others not to disturb the engraving. Footprints are found less frequently than hand prints and stencils, and this may explain why they are less researched. It is doubtless that the appearance of so many footprints in Namibia especially bears significance. [ii] Stow, GW. 1905. The Native Races of South Africa cited in Mguni, S. Termites of the Gods 2015.